Qatar 2022: Khalifa Stadium reaches height of 120 meters! Late on Wednesday Khalifa Stadium in Doha received the single last piece of its eastern arch. The steel segment weighed 47 tons and was tricky to install. Its final position is 120 meters above ground and had to be put exactly between already erected arms of the arch. A 600-ton crawler crane was used to make it possible. With this step carried out successfully, the stadium in western Doha has almost all of its primary steel structure ready. The expanded concrete stands underneath are also structurally complete, though work will still go on until later this year. 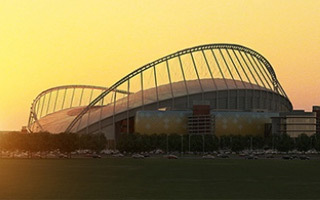 With completion planned by late 2016, the expanded stadium will be Qatar’s first to be delivered for the 2022 World Cup. As the recent operation is complete, Khalifa Stadium reaches a new height peak at 120 meters, being among the tallest stadiums worldwide. Of course the building already had an arch in the east, but it was removed and replaced by a greater, stronger one to support the stadium’s first complete roof over the stands. So far only the west side had cover, based on a smaller arch.